Between now and the start of the World Cup, we will be looking back at previous tournaments with the help of some of the key characters and the BBC's archive footage. Today, we ask the Golden Boot winner about his Italia '90 experience. I can see it all now as clearly as if it was yesterday. 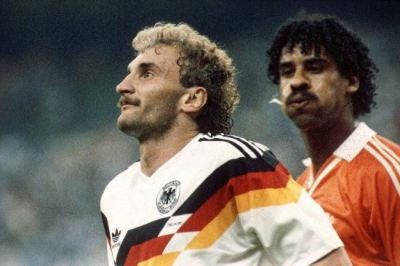 Gazza's tears, Schillachi's bulging eyes, Milla's hips and Rijkaard's phlegm are destined to hold a special place in my heart forever, all played out to the incomparable soundtrack of Nessun Dorma. After all, the 1990 World Cup in Italy is my World Cup. Every kid gets one, and Italia '90 will always belong to me. Between now and the start of the World Cup, we are looking back at previous tournaments with the help of some of the key characters and the BBC's archive footage. Today, there's Austria's greatest moment and Archie's artistry. Set against a backdrop of political uncertainty and shorn of the illuminating genius of the world's finest footballer in Johan Cruyff, the 11th staging of the World Cup was perhaps the most controversial of them all. That it ended with a fairytale first victory for the hosts Argentina remains the subject of contention to this day, with the suggestion the country's military dictatorship aided the team's triumph continuing to cast a regrettable shadow over their achievement. Between now and the start of the World Cup, we will be looking back at previous tournaments with the help of some of the key characters and the BBC's archive footage. Today, we speak to the man who witnessed the Cruyff turn at first hand and the top scorer at the 1974 finals. Between now and the start of the World Cup, we will be looking back at previous tournaments with the help of some of the key characters and the BBC's archive footage. Perhaps the most indelible image from any World Cup is that of the peerless Pele playing a perfectly weighted pass at the end of the 1970 final for a marauding Brazil captain Carlos Alberto to thump home. Between now and the start of the World Cup, BBC Sport will be looking back at every tournament since 1966 with the help of some of the key characters. When football truly did come home. Thirty years before Frank Skinner and David Baddiel used the tagline to awaken the nation's sporting senses ahead of Euro 96, England's footballers put their country on top of the world.